So Many Stamps So Little Time: Saturday Morning Sunshine - New Stamps! Finally a morning with sunshine, and that makes me so happy! Yesterday my mailbox was flooded with new stamps, (I love it when that happens!) and today I couldn't wait to play with my new PTI goodies! 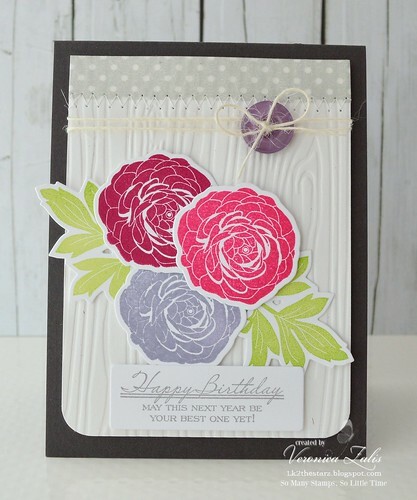 To create my card I used "Cutting Garden" and the matching dies. I probably missed this bit of info during the release, but I was very happily surprised to find the flower , and stem and flower dies to be open face like Spellbinders! This made stamping and cutting out SO much easier! I used Stampin Up ink to stamp my blooms, and Mojito, by Fresh Ink to stamp the leaves. My card base is PTI Smokey Shadow, and the woodgrain layer Rustic White,also from PTI. I am happy you stopped by, and I hope you have a great weekend! This card is so beautiful. I missed that announcement, too about the dies--so maybe it was supposed to be a surprise? Anyway, my package is still en route, so it was a treat for me to see what you have done. I also wanted to thank you for the loads and loads of inspiration you provide me every day. I always look, but don't always comment. You have phenomenal style. Very pretty card! Love all the different colors you used on your flowers...just like the Ranunculus that bloomed in my garden once! My box with my new Cutting Garden stamp set is sitting on a stool in my craft room...LOL! Guess I better get crack in! Very lovely, Veronica. I didn't get this set but maybe I will "have to." This is gorgeous. I can't wait to get my set and dies. I wanted to say, too, that I had a card published in the Holiday Cards issue and finally got my copy! I was so impressed to see so many of your cards in that issue-- congratulations! this is so beautiful! that woodgrain is pretty perfect! What a great result to your playing with new toys! Of course the flowers are beautiful, but I really love the polka-dots on the top!